"I am Sarah Palin. ", originally uploaded by conradh. I failed once again to take the rocket launcher with me in the car. 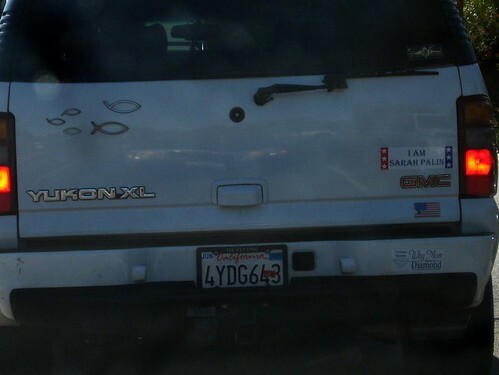 What’s up with the one-fin jesus fish. Is that code for ‘woman’? is that a representation of the family? Is the husband jesus? And it looks like one of the child-fishes has no fins. Was there a shameful chromosomal anomaly? The fishes are reproducing, but keep failing to produce healthy offspring. Someone SOOO had to say it! and if they were republicans would that be Borndede. The’s Tanned, He’s Rested! He’s Reanimated!!! that’s like MCCARTHYISM THE LAST REFUGE OF THE LEFT, right? ARE YOU BEING PREMATURELY ANTI-FASCIST AGAIN? whaddya mean PREMATURE. WISE, MANLY, FULLY GROWN ANTI-FASCIST. It’s about putting the Pat back into Pat-RiotIsm. It is much more ecologically friendly.. But does it work on fish? You live in LA. You could probably buy another rocket launcher for your car with no problem. I AM HARRY DEAN STANTON! HUR DUR. I AM A POTTED PLANT. I bet they were indeed XL.